The Iron You: Eggplant Parm "Meatballs"
To be honest, I have mixed feeling about traditional eggplant parm. As with many popular dishes there are many awful ways to make it. If you order eggplant parm in a run-of-the-mill restaurant or in a pizza parlor you’ll probably get mushy slices of soggy eggplant, slathered with greasy cheese, covered with a dubious tomato sauce. It’s all too much, too heavy. Still, if you show up at my place with a casserole dish of your grandma’s eggplant parmigiana, I will probably hug you, because I don’t, in fact, always feel like cooking. I will open a bottle of red wine, we will ravage the parm, and have an awesome evening. The other night — as I was wondering what to do with the eggplant that has been sitting in the fridge for a few days — I had an epiphany: what about making eggplant parm in “meatball” form? So BAM! 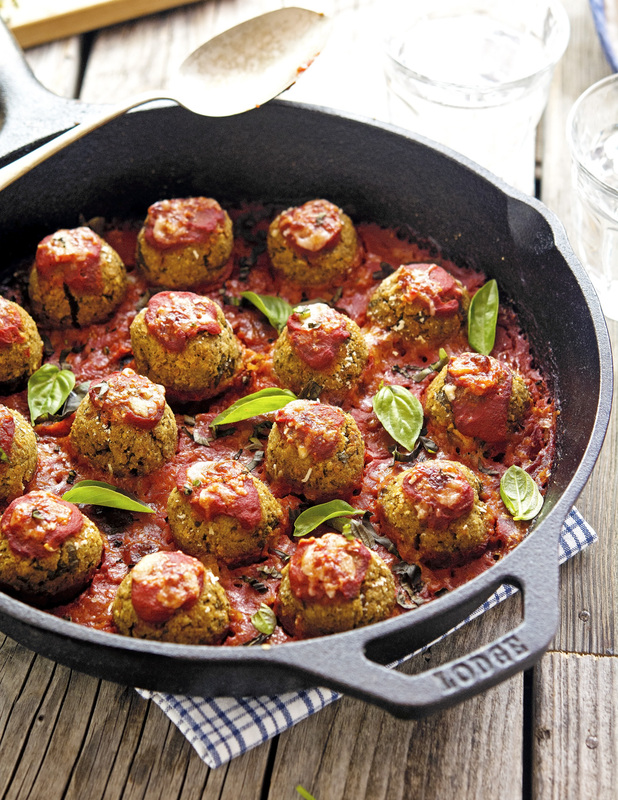 there you have it: Eggplant Parm “Meatballs”. These were a hit! I made them for a group of friends, everybody loved them. Great as an appetizer or as the main meal with a salad on the side. These “meatballs” are amazing and so easy to make too. Eggplant Parm “Meatballs” Print this recipe! Preheat oven to 375ºF (190ºF) and place a rack in the middle. Lightly grease with olive oil a large rimmed baking sheet. Set aside. Heat olive oil in a large skillet over medium-high heat. Add eggplant and ¼ cup of water. Cook for about 10 to 12 minutes, until eggplant has softened. Place in the bowl of a food processor (or blender) and puree until smooth. Transfer to a large bowl, add almond meal (or breadcrumbs), egg, 4 tablespoons of Parmesan cheese, basil, and garlic. Season with salt and pepper. Scoop one tablespoon of eggplant mixture and with dampened hands roll tightly into balls. Transfer to prepared baking sheet and bake until firm and browned, about 20 minutes. Return the skillet to the heat and add tomato sauce. Add “meatballs”, spoon a bit of tomato on top of each “meatball”, sprinkle with remaining Parmesan cheese, and simmer for 5 minutes until heated through. Alternatively place the skillet under the broiler for 2 minutes until the cheese has melted. One serving yields 332 calories, 23 grams of fat, 19 grams of carbs, 13 grams of protein. Hi Mike, I really like these "meatballs", very clever recipe. What a cool idea, this would be a great option for vegans. :-) I'm pretty done with summer at this point, but, unfortunately, the temps here don't start really lowering until November or so. Womp womp. Enjoy your seasons my friend! 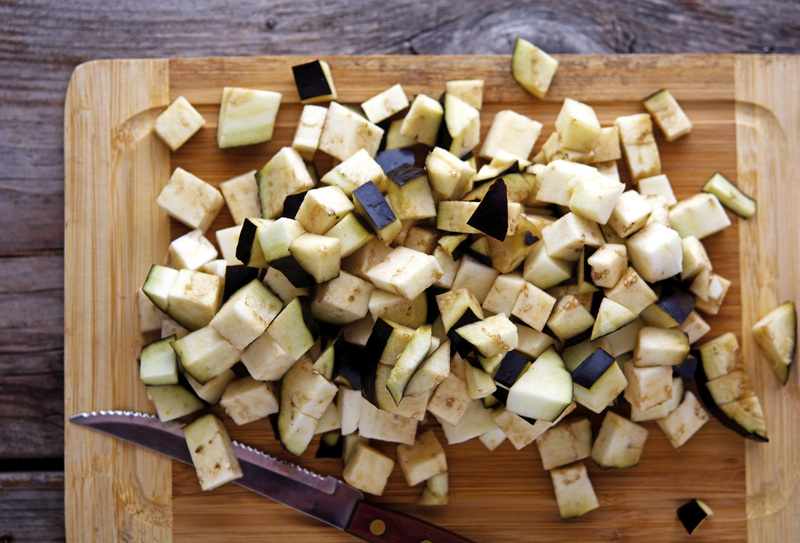 Eggplant is such a trooper, you can make almost anything with it! Oh wow looks so yummy! Dude, what are you doing to me? 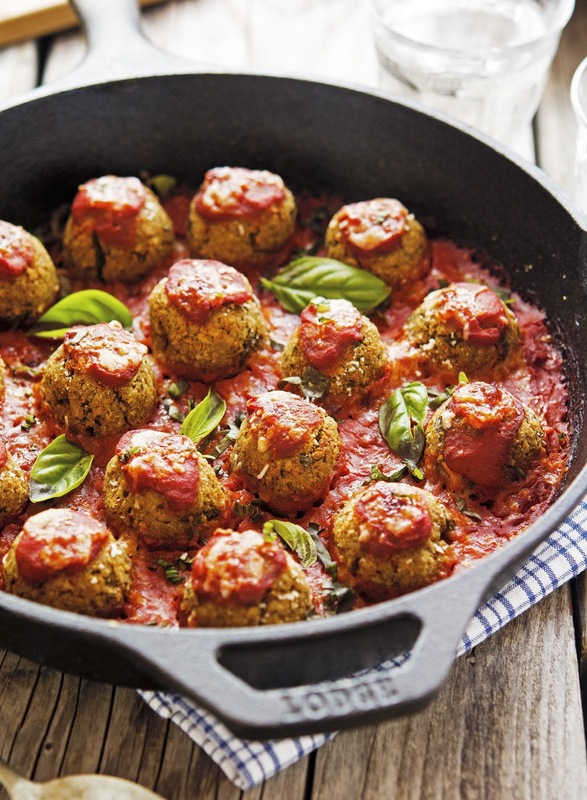 First, you've inspired me to try zucchini noodles, and now you've got these awesome eggplant 'meatballs'? Such a great idea! And even though I do love eggplant all year round, they are always associated with a fall season to me. Thus I've got to make them soon. Mmmm...what about zucchini noodles topped with eggplant meatballs? Aka zucchini alla norma (fusion version). Definitely pinned! I think I could hug you for these balls! Duuuude - eggplant and almond meal IN the "meatballs" - I see why these were a crowd pleasure! Freakin AWESMAZING, my friend! What a brilliant idea, no wonder your friends enjoyed this way to prepare eggplants. And as a bonus, it's so easy to prepare. I know, right? Easy and delish, what possibly do you want more? These sound amazing, and I will probably be making them tonight! I was curious about one thing, however: you've been the champion of cauliflower-based bread substitutes. Do you think that riced, cooked, squeezed cauliflower would work as a binder instead of the almond meal? Just wondering! I finally made these last night: oh my lord, theyre sooo good. Thank you for this! Yeah man, it's called The Iron Delivery. Just order on line, in 5 minutes a triathlete will be knocking on your door with your dinner. Hey, I'd like to get in on that delivery service! Woo Hoo!!! Dude, this is such a great idea! Love this... gonna try at my next party where I serve a whole bunch of different appetizers. People freaking love meatballs, and this is gonna be epic! I am sure your friends love this, look at how amazing it is. To be honest, I'm not a big fan of eggplant parm the traditional style, so this one I love. Looks so much like kofta curry. Neat idea as usual. What an inspired idea! I hate pan-frying each slice of eggplant for the traditional dish because it takes forever to coat each little piece of eggplant. I'm totally with you on the dubious eggplant parm, too often it's totally soaked in grease, but this definitely looks like the answer to my laziness in the kitchen! I've never made non-meat meatballs before! But LOVE me some eggplant parm. Except when it's soggy and greasy, like you said. Gotta try this! Great idea... love the recipe... but can i substitute the egg with anything else? omg these are soooo good. I have added a little something to make them my own! ill be making them as an appetizer at my nutrition club party coming up! These look amazing. I am thinking of adding some paprika/cajun seasoning to increase the spicy/smokiness of the recipe, but that's my preference. We just tried these tonight and LOVED them! Thanks so much! Can these be frozen . ?